​Hacienda Buena Vista was established ca. 1870 by Spanish immigrant from Mallorca Bartolomé Mora. By 1890 it consisted of 240 cuerdas 50 of which were planted with coffee trees. Mora returned to live in Mallorca in 1892 and sold the plantation to its then administrator Juan G. Frontera Ripoll (1866-1928). It has been reported that it was sold to Antonio Frontera Ripoll apparently in error as Antonio died that same year as an unmarried 17 years old. Juan G. Frontera Ripoll was also a Spanish immigrant from Mallorca who arrived in Puerto Rico in 1881 and in 1895 married Juana Vivaldi Pacheco, his brother Bartolomé (1870-1956), who arrived on the island in 1890, owned a coffe plantation in Barrio Rio Prieto of Yauco. Upon Juan's death in 1928 the hacienda passed on to his son Bartolomé Frontera Vivaldi (1896-1994), it is now owned by his son Nestor Frontera Soto who lives in the hacienda. It is located in Barrio Indiera Alta, fairly accessible on a 600m paved trail heading East off of PR-128 Km 34.2 .​ The Casona or Manor House was built in 1889 by Juan Frontera Ripoll. On or around 1936, some 80 cuerdas were sold to the Puerto Rico Economic Development Administration (PRERA). Subsequently additional lands were sold, currently consisting of 67 cuerdas. 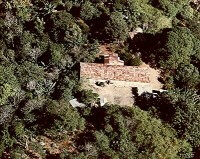 The aerail pictures is made available the courtesy of Archeologist Dr. Luis Pumarada O'Neill. The other pictures are part of a 1987 study made by Dr. Pumarada O'Neill. Source: Puerto Rico State Historic Preservation Office.